Listen to One Direction on internet radio with free music downloads. Released a day after Zayn Malik left One Direction, "Drag Me Down" was the least promoted of One Direction's songs.But it was more than just a song, "Drag Me Down" conveyed a message to one directioners that Zayn Malik has not been missed by the band and it's business as usual. Timing of Drag Me Down's release could not have never been better,just a few days after band member Louis Tomlinson's scandalous baby boy was born to his 'never before mentioned' girl friend..Los Angeles based hair stylist Briana Jungwirth. While Zayn Malik left the band to make real music, "Drag Me Down" became the fastest song ever to reach the top spot on itunes U.S.A, it achieved this incredible feat in less than 30 minutes of it's release on 31st of July, 2015. 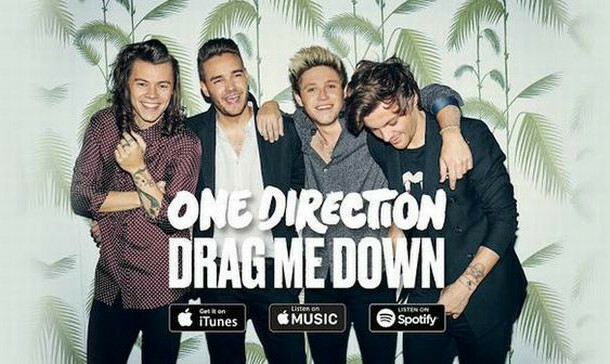 Streamed more than 3.5 million times on Spotify, the very first day of it's release..."Drag Me Down" sold more than 310,000 copies on itunes, within the first 7 days of it's release. Within the same 7 day period.."Drag Me Down" streams exploded on Spotify, totaling a massive 17.7 million streams in it's first week.It also became One Direction's first no.1 song in the U.K charts, for almost two years..since "One Way or Another" reached the summit in 2013. "Drag Me Down" still holds the record for the most streamed song in a single day on Spotify. This uptempo pop rock beat, received much of it's positive response..for the first time,outside the U.K, especially in France and Australia where it reached the no.1 spot with ease. From a marketing point of view...Drag Me Down's promotion waa a total disaster.Twitter was the only marketing tool used to promote the album when it got released on itunes on the very last day of July 2015. 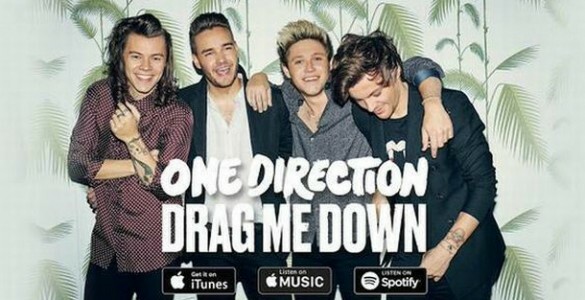 No ads on Youtube, MTV, Dailymail or The Telegraph..Liam Payne, One Direction's band member took the honors of announcing Drag Me Down's release on his twitter account within a few hours of the song's release on itunes. Album - Made in the A.M.
You've never seen it look so easy. Baby, you're my only reason. The shell of a man who could never be his best. You taught me how to be someone, yeah. When no one else was ever behind me. With your love, nobody can drag me down. Baby you're my only reason. The shell of a man who could never be his best (be his best). With your love, nobody can drag me down!